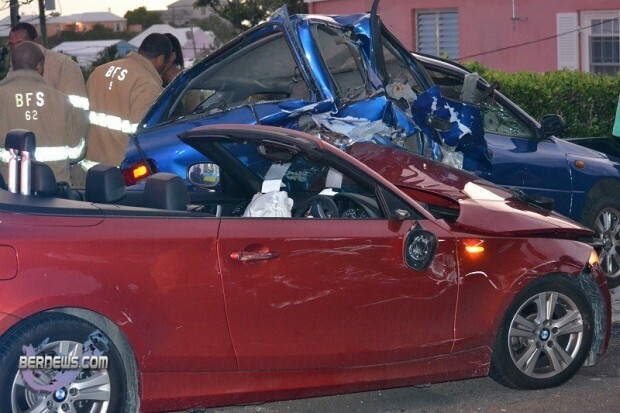 In Magistrates Court yesterday [Mar.23], 34-year-old Tokio Russell pleaded guilty to driving whilst impaired. 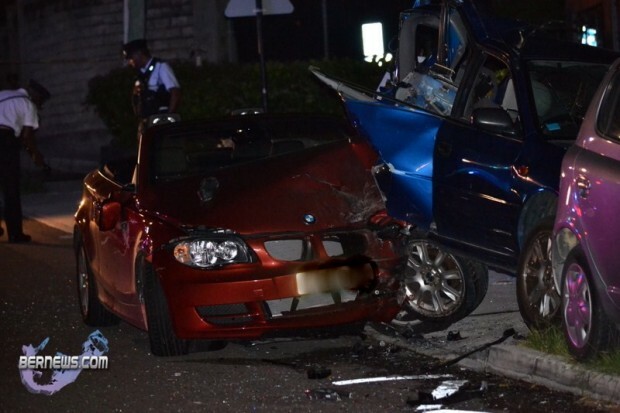 Last year, Mr Russell was involved in a three car collision in which his new BMW Cabriolet smashed into two other cars. Police noticed also that his breath smelt of alcohol and they took him into custody and into Hamilton Police Station and subsequently charged him. Accepting his guilty plea, Magistrate Khamisi Tokunbo questioned Mr Russell, asking if he had been driving a ‘Beemer’ and what make and model it was. Mr Russell said it was the canvas-topped Cabriolet model. Magistrate Tokunbo said: “I feel your pain” and fined him $800 and disqualified him from driving all motor vehicles for twelve months. Mr Russell, a W&E employee, asked for time to pay the $800 fine and was given until 30th April 2012. After the incident last year, a police statement said the car was travelling along Frog Lane when it collided with two other cars in the area; one parked and one stationary. Five people suffered minor injuries and were treated in hospital, and a 34 year old man was arrested on suspicion of impaired driving, failed an alco-analyser test and was detained. He’s driving a BMW and he wants time to pay the fine. What the hell man? A Works & Engineering employee driving a $100k car? WTF? I need a job at W&E. And the judge “feels his pain” and cuts his fine from the usual $1000 to $800 AND gives this bozo additional time to pay. Where do we get these numbnuts? Innocent people were hurt and two other cars were destroyed when this drunken, overpaid moron came through the streets at considerable speed and rammed into the back of both cars. And the judge “feels his pain”. Bermuda’s new national emblem must be the banana. Couldn’t of said it better myself! Difficult feeling sorry for such a tool. Hundred grand car and he needs time to pay $800. It says everything about Bermuda’s sense of values. He works for W&E and can afford a $100k car???? Hmmmm….does he have a 2nd job of some sorts? Unbelieveable. Drunk driver smashes into 2 parked cars and injures 5 people. Gets fined $800 plus time to pay. Compare that to a driver pulled over for talking on cell phone. No damages, no injuries, $500 fine. But I do think its hilarious that he pleads poverty and cant afford to pay $800. He probably had more than that stashed in his pockets. Of course he’s broke-he just wrote off a $100k car! His insurance would have provided him with liability coverage (even if he was drunk)for the other vehicles, but no protection to replace his own, I’m sure. Despite the comments, I’m sure he must have gotten a loan to cover at least part of the cost of the vehicle-money he has to still pay back while also having to pay for another mode of transportation! In my opinion, he should have been FIRED from his job…he could have killed someone. Fired? The accident has nothing to do with his job. what are you saying , do have any idea how much money these guys get paid for doing next to nothing ? At least these people give all that tax to the government. That car is about £25k in the uk and that’s including car tax and vat! He should have been fined more if he can afford that not less. Having trouble deciding who is the bigger idiot….. Magistrate Tokunbo or Tokio Russell…..
Tokumbo – only because we should expect better from a judge. If you look back at all of tokunbo’s cases he hates giving time to people …it’s either a small fine or slight time check it out or just watch his cases from here on in. Shove his a#s in jail if he can’t pay there $800 fine. what about the clowns that drive 100K cars, boats, own night clubs, houses, and when they get caught for drugs, use our money via legal aid to hire a QC…..idiot government policies! Dumb a#ses! Driver & judge. The fool drives around in a $100K car & wants time to pay????? Give us a break. Where are your prioritys driving around in a $100K car anyway? Simply owning a BMW like this is nuts on an island where we only drive at 30mph, most of the time alot less because of traffic. It is all about the bling factor I guess. I’ll stick to my 8 year old class B. Clearly he has to pay the insurance for everything because insurance does not pay when alcohol is involved…. duhhhhh!!! You sound like a hater. Who cares what people buy? People prefer to spend their money on different things. He got this expensive car, somebody else bought an expensive house, others go on loads of expensive vacations and some simply just can’t afford anything. People have wants for different things. Don’t knock them because they spent it on something you prefer not to buy. Many Bermudians put themselves in debt trying to keep up with trends, fashion and bling. It is stupid to spend that much money on a car. I don’t care how much money you make or how much you have, it is ridiculous to spend 100k on a car. People need to wake up and realize that there is more to life than materialism. There are people starving all over this world yet we worry about what we wear and what we drive. I think it’s funny that he will now have to pay a massive loan off without being able to have the car. Serves him right. Oh, so it is his car !!!! The Magistrate must be a “Beemer” enthusiast and Tokio Russell must be a member of the BMW Club…Bermuda’s Materialistic Wannabees! fool. 34 years old and don’t know what $100K is. Could have put that down for a condo with ocean views. The judge feels his pain? Clearly this judge’s priorities are horribly skewed if he’s offering sympathy to a drunk driver. Maybe because Tokunbo has a Beemer as well he gave him a discount on the fine..Makes no sense at all..
Wonder if this is the same guy who drives the $60K deluxe W&E Jeep for his day job? As absurd as this is, Magistrate Tokumbo fined him within the confines of the law. He was convicted for drunk driving. Fortunately no one was killed. With regards to him owing a $100K car, any moron can get a loan if he has substancial cash in his account, has a job and if he stays at home with Mama, etc. Regarding Magistrate Tokumbo’s comments, I’m not surprised! its amazing what u can ‘learn’ from these bloggers ‘comments’. didnt know the judges’ name used to be Tony Simmons! Wow, I really liked that BMW when it was in the showroom. champagne taste, gingerale pocket ,rootbeer wallet !!!!! He may have said “my” car, but in the comments from the story about the accident when it was first published….the car wasn’t even his. Probably didn’t want to go to court sounding like an even bigger douche by admitting he smashed a car that wasn’t even his! I am amazed at the people who can afford these expensive cars. Every week I pass the crowd of people waiting for the Hustle truck —one waits beside his very expensive sports car. Now figure that one out ! It’s all about priorities & his are clearly wrong! 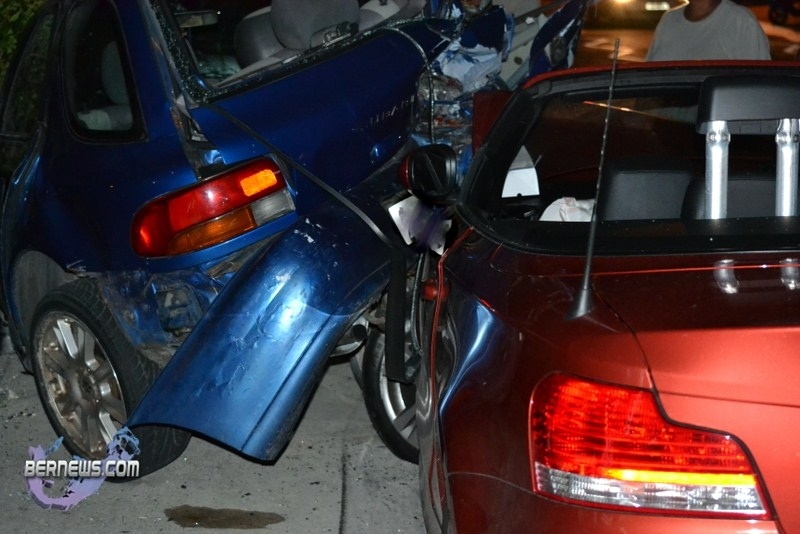 It should have been the mandatory $1,000.00 fine & a year off the road like all other drunk drivers. He’s just so fortunate that no one was killed by his stupidity of drinking & driving, including himself . . . While he & the magistrate were more concerned about his $100,000.00 car being damaged? YA’LL BERMUDIANA’S SHOULD SHUT UP & MIND YA OWN DAMN BUSSINESSSSS!!! Stay out of the news and nobody has anything to say. You don’t wanna hear it? Stay off Bernews. If it was inline with your opinion you wouldn’t be cap locking us right now. Damn !!!! $100K, I hope he owns his own HOUSE !!! Cause if i had tht car it wld be parked in a garage and not outside paying RENT !!!! smh !!!! The things i see ppl have and thy dont have their own house.. Dude still has to pay for the car to.. He really got dealt a BAD hand.. He didnt know how to play the hand he was given.. Damn Bermudians are so quick to pass judgement. It’s not his car but he was responsible for it while the owner was off island. And the owner can definitely afford that car.